The young people defined as “Gen Xers” in the media and popular imagination almost never include poor or working-class young adults. These young people - a huge and important part of our society - are misrepresented and silent in our national conversation. In The Unknown City, Michelle Fine and Lois Weis offer a groundbreaking, theoretically sophisticated ethnography of the lives of young adults (ages 23 to 35), based on hundreds of interviews. We discover their views on everything from the construction of “whiteness” and affirmative action to the economy, education, and new public spaces of community hope. Finally, Fine and Weis point to what is being done and what should be done in terms of national policy to improve the future of these remarkable women and men. “Michelle Fine and Lois Weis enable us to hear the sounds of despair interwoven with hope, with outrage, with new kinds of determination. . . . 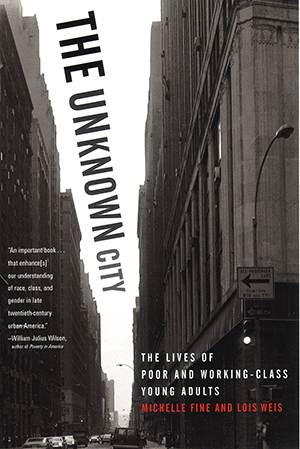 The Unknown City calls out to its readers for new modes of solidarity, for the kind of theory that may infuse activism.